OBceans crowd in lobby with Councilwoman Zapf after City Council vote, Nov. 9, 2015. Photo by Conrad Wear. When the final City Council vote came down last Monday, November 9th, as it approved the OB Community Plan Update, it was a signal to all the OBceans and city planners who have been part of its creation over the last months and years to heave a great collective sigh of relief. The last leg of the update process was a period of two and a half years, as it was long ago, on June 5th, 2013, when city planner Maxx Stalheim presented the OB Planning Board with a Draft Update – after years working with the update sub-committee members. And the Plan took this long to reach the City Council for their final vote this week. Just this final leg of the Update saw 3 different chairs of the OB Planning Board (Tom Gawronski, Pete Ruscitti, John Ambert), 3 different city planners (Maxx Stalheim, Theresa Millett, Karen Bucey), 3 different City Council members (Kevin Faulconer, Ed Harris, Lorie Zapf) – and a constant change over on the volunteer Planning Board. The update process itself – initiated by the then-City Planning Department (since morphed into Development Services Dept.) – began in the early years of the century – 2002. The process stalled for a while, due to 2 challenges: the update of the City’s General Plan, which took precedent, and extreme cut-backs in the Planning Department by Mayor Sanders during his administration. City efforts and focus on the OB Plan geared up again back in 2006, with a draft plan presented to the community in 2007. 2002 – update process begins; Community meetings identified issues to be addressed, with major theme – need to maintain and enhance the existing development pattern and “small-scale” character of Ocean Beach. 2008 – city decided that Update would require an Environmental Impact Report (EIR) based on existing traffic conditions. 2009 – Funding for the EIR was secured. June 5, 2013 – OB Planning Board presented with copies of the brand new Draft Ocean Beach Community Plan Update by Maxx Stalheim, senior planner. Stalheim declared that the updated plan was “fundamentally a new document” from the former OB Precise Plan. “Tonight is a milestone in the process,” he said. June 19, 2013 – Draft made available to public online. April 30, 2014 – City Council’s Smart Growth and Land Use Committee, chaired by Lorie Zapf, unanimously authorized the Plan Update to proceed to the Planning Commission later in May and then the full City Council itself in early July. May 14th, 2014 – OB Town Council passed resolution in support of the new OB Community Plan. May 22, 2014 – Update went in front of the City of San Diego’s Historical Resource Board and received their okay. 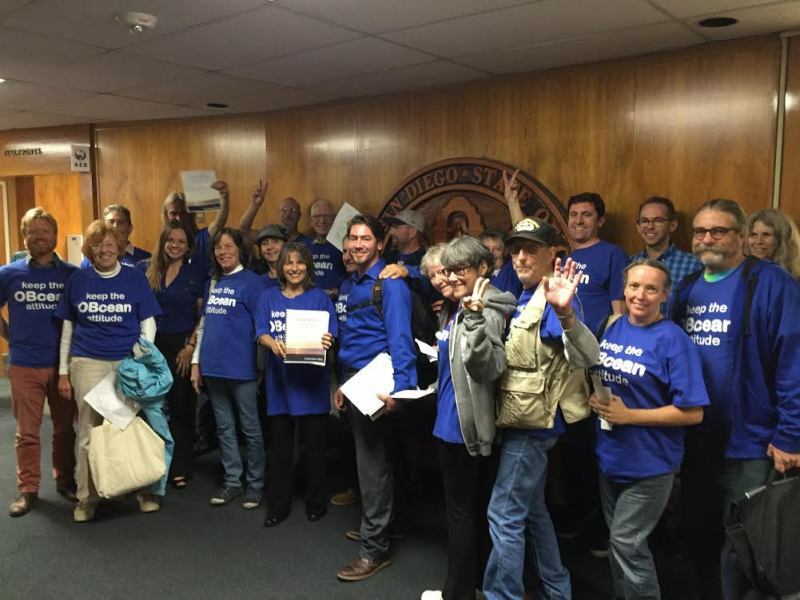 August 13, 2015 – California Coastal Commission unanimously approved the OB Community Plan Update after last-minute compromises between staffs, inspired by large turn-out of OBceans in City Hall chambers of Chula Vista. November 9, 2015 – Last approval of OB Plan by San Diego City Council. January – February, 2016 – OB Plan on consent agenda of Coastal Commission – automatic approval.